What’s black, white and endangered all over? If you guessed a small bird native to North America called a piping plover, you’re right. Piping plovers are small migratory shorebirds weighing approximately 43-63 grams. They may be recognized by their short, orange beak with a black tip and orange legs. These little birds rely on their feathered disguise for survival. Their mostly pale brown/grey backs help camouflage them in sandy surroundings. In Canada, this species lives along the Atlantic coast and in wetlands in the northern Great Plains and western Great Lakes. Since 1985, the Committee on the Status of Wildlife in Canada (COSEWIC) has designated the piping plover as endangered or at risk of extinction. This species is extremely sensitive to any disturbances on the shores where it nests. But now, thanks to efforts of Nature Conservancy of Canada (NCC) volunteers, piping plovers have just a few more safe places where they can breed and rear their young. With the help of Bird Studies Canada and our Conservation Volunteers (CV), NCC is protecting piping plover habitat across Canada to give this species a leg up (or a wing up, to be more precise). 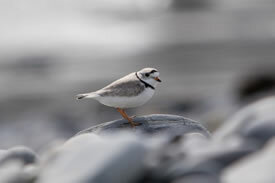 In Nova Scotia, NCC has conserved four properties with, or next to, piping plover nesting beaches. Thanks to signs and barriers installed by NCC, beach goers know to keep away from active nests. This year, NCC is holding CV events across the country to restore areas where piping plovers are known to nest. Beach clean-ups aim to clear away litter or other items that could have washed up on the shore and that might impede the plovers’ nesting. 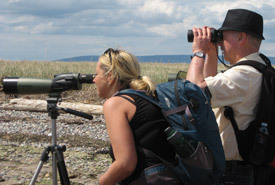 In the prairies, volunteers conduct population surveys to determine the presence or absence of the endangered shorebird. Saskatchewan and Alberta are brimming with potential piping plover habitat. The International Piping Plover Census, which happens every five years, aims to collect information about these birds in both their breeding and wintering areas. NCC partners with the international initiative by providing the data collected by our volunteers. In Saskatchewan specifically, NCC has partnered with Nature Sask and other agencies to complete the census. In order to secure viable piping plover habitat, NCC has implemented exclusion fences around saline basins, adjusted livestock stocking rates and deferred grazing. It is anticipated these actions will provide piping plovers with the habitat they require to maintain or increase their populations during their breeding period. Conservation Volunteers’ helping hands ensure these endangered birds have a safe place to nest and spread their wings. NCC’s efforts in protecting piping plover habitat are made possible by the tireless work of our Conservation Volunteers. To join a CV event near you, visit www.conservationvolunteers.ca. 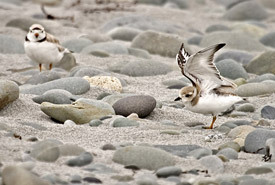 If a piping plover senses danger from other species or from humans, it will often abandon its nest and unborn young. Piping plovers breed and nest on sandy beaches during the spring and summer months, which also happen to be peak seasons for beachgoers. Beaches also lack natural cover, making nests (made of gravel, rocks and broken seashells) vulnerable to predators such as feral cats, foxes and other small mammals. A lack of cover also makes the species vulnerable to extreme weather and high tides, which can destroy delicate nesting habitats and harm chicks.